PMR offers a ten-year forecast study for the global consumer identity and access management market for the forecast period of 2018 to 2028. Consumer identity and access management software solutions are estimated to be the most attractive in terms of market value, during the forecast period, as compared to the consumer identity and access management services. 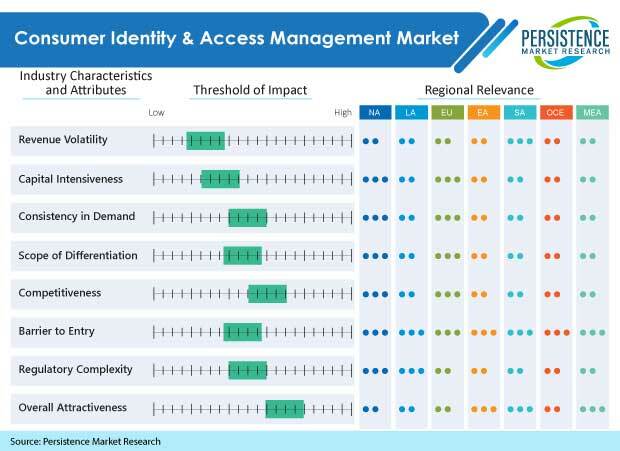 This market study featured the consumer identity and access management market dynamics and latest market trends, globally across seven regional markets: North America, Latin America, Europe, South Asia, East Asia, Oceania, and the Middle East and Africa that influence the present outlook and future growth of the consumer identity and access management market. The consumer identity and access management market research study provides an exhaustive analysis of the global consumer identity and access management market and offers insights regarding the forecast and macro-economic factors influencing the adoption of consumer identity and access management components and their practicality for modern day enterprises. The consumer identity and access management market research report includes an exhaustive analysis on the key consumer identity and access management industry dynamics, and the overall consumer identity and access management market structure. The market study offers a comprehensive assessment of various stakeholder strategies and imperatives for succeeding in the consumer identity and access management business. As per the report, the global consumer identity and access management market is segmented based on technology, industry, end user, and component, across different regional markets. The consumer identity and access management market study starts with an overview of the global market in terms its overall value. Additionally, this section also offers analysis of key industry dynamics from the economy, demand and supply sides that are influencing the global consumer identity and access management market. With regards to the component, the global consumer identity and access management market is segmented into software solutions and services. The consumer identity and access management software solutions are further sub-segmented into advanced authentication, profile management, and credentials management. The consumer identity and access management related services are further sun-segmented into professional services and managed services. On the basis of deployment, the global consumer identity and access management market is segmented into on-premises deployment and Software-as-a-Service (SaaS). With regards to the industry vertical, the global consumer identity and access management market has been segregated into finance and insurance, public administration, healthcare, educational services, telecommunication and information technology, and media and entertainment, among other end-use verticals. An exhaustive market analysis has been performed for each consumer identity and access management market segment in terms of its market size in every regional market. This section also provides an extensive analysis that features the ongoing trends in the global consumer identity and access management market. The next section in the consumer identity and access management market study offers an exhaustive analysis on markets across various countries in different business regions. It offers a forecasted market outlook for the forecast period of 2018 to 2028, which includes the latest technological offerings and key innovational developments in the consumer identity and access management market. This section also discusses the key market trends in countries contributing to the growth of the overall consumer identity and access management market in a region, and analyses the degree at which the market dynamics are influencing the growth of the consumer identity and access management market in every region. Key regions and countries assessed in the global consumer identity and access management market study include North America – U.S. and Canada; Latin America – Brazil, Mexico, and the Rest of Latin America; Europe – Germany, Italy, France, U.K., Spain, Russia, and the Rest of Europe; South Asia – India, Indonesia, Thailand and the Rest of South Asia; East Asia – China, Japan, South Korea; Oceania – Australia and New Zealand; and the Middle East and Africa – Northern Africa, GCC Countries, South Africa, Turkey, and the Rest of Middle East and Africa. This global consumer identity and access management market study features the present scenario and the future growth prospects in the consumer identity and access management market across all the business regions for the forecast period of 2018 to 2028. 2017 has been considered as the base year for the study, and the market data has been provided for the remaining 12 months. In order to get an accurate forecast, we initially evaluated the current market size, which provided a platform for us to understand the future growth prospects and trends in the consumer identity and access management market. We have triangulated the overall market growth trend, as per the characteristics of the global consumer identity and access management market, with the help of different analytical outcomes. The global consumer identity and access management market has been segmented into different market segments, as highlighted previously. All the consumer identity and access management market segments have been analyzed in terms of basis points system (BPS), which enabled us to showcase the relative contribution of every market segment made to the growth of the global and regional consumer identity and access management markets. Basis points system plays an important role in deducing various growth trends in the global consumer identity and access management market. Another important feature of the global consumer identity and access management market research report is the absolute dollar opportunity analysis performed for every market segment. This factor is generally overlooked while analyzing market trends. Absolute dollar opportunity analysis plays a noteworthy role while researching a market, as it showcases the level of opportunity that a consumer identity and access management solution and service provider can look forward to achieve during the forecast period. Finally, we have added a competitive landscape in order to provide a dashboard view, which is based on categories of vendors in the consumer identity and access management value chain, key market differentiators, and their presence and footprint in the consumer identity and access management solution portfolio. This competitive landscape section has been designed to provide an exhaustive and comparative analysis of key vendors specific to each consumer identity and access management market segment in the global supply chain. The global consumer identity and access management market research report offers market segment-based vendor or supplier insights which enable the identification of key market competitors in the global consumer identity and access management market. This is done on the basis of an in-depth analysis of growth and success capabilities in the consumer identity and access management market arena. Detailed company profiles of various consumer identity and access management solution and service providers are also added in the competitive landscape. These company profiles help evaluate the short-term and long-term strategies, key product offering, and vendor financials in the global consumer identity and access management market. Key consumer identity and access management market competitors covered in the global consumer identity and access management market report are IBM Corporation; Microsoft Corporation; SAP SE; Ping Identity; Okta, Inc.; Acuant, Inc.; Trusona; Globalsign; Iwelcome B.V.; Loginradius, Inc.; Janrain, Inc.; and Forgerock Inc.
Consumer identity and access management (IAM) solutions enable enterprises to securely manage and capture consumer profile and identity data, as well as control consumer access to systems, services, and applications. Fully-featured consumer identity and access management solutions generally offer a suite of features that include consumer registration, self-service account management, preference & consent management, Single Sign-on (SSO), Multi-Factor Authentication (MFA), access management, directory services, and data access governance. Robust consumer identity and access management software solutions facilitate a secure seamless consumer experience with enhanced performance, irrespective of the platform used by consumers to engage with a brand. The enterprise software applications market is continually growing and evolving. The consumer identity and access management market has witnessed exciting new developments at a rapid pace in the recent years. Moreover, the adoption of cloud-based solutions around the world is increasing. The rising adoption in small and medium enterprises is expected to collectively result in the higher adoption of enterprise applications, which is expected to eventually support the sales of consumer identity and access management solutions at the global level. According to a recent analytical study of Persistence Market Research, the global consumer identity and access management market revenue will approach the valuation of US$ 50 Bn by the end of 2028. With respect to component, the consumer identity and access management market has been segmented into software solutions and services. Consumer identity and access management software solutions are estimated to continue to hold the largest market share throughout the forecast period. These consumer identity and access management software solutions are also estimated to register a high growth rate during the forecast period as compared to the expected growth rate of consumer identity and access management-related services. The consumer identity and access management software solutions segment is subsegmented into advanced authentication, profile management, and credentials management & profiling. The advanced authentication software for consumer identity and access management subsegment is estimated to record the highest growth rate among all the software solutions of consumer identity and access management. Enterprises are undertaking digital business process initiatives that are aimed at transforming the manner in which consumers look to interact with brands. Consumer identity and access management solutions enable a consistent, secure, multichannel consumer experience, which helps in the transformation of an enterprise’s digital business. As this trend of business transformation is penetrating deeply across the world, enterprises are looking to procure efficient consumer identity and access management solutions, which is expected to mutually facilitate business growth, as well as boost the consumer identity and access management market. Taking measures for the prevention of data breach has become a priority for IT security teams. Consumer identity and access management solutions offer end-to-end data security features, specifically for consumer identities, owing to which they serve as good prospects for decreasing the risks of data thefts. Hence, the demand of consumer identity and access management solutions is increasing. Meeting consumer privacy regulations has been a daunting task for consumers. Consumer identity and access management solutions provide the consumers centralized data access governance policies and other similar capabilities that help ensure that consumer data sharing consent, regional data storage, and other privacy mandates are met. At present, the launching of new applications has been a catalyst for providing a consistent consumer experience across different channels. This helps enterprises lay a foundation and introduce parameters, such as the scale, performance, security, single sign-on, and social login, among other capabilities. These features are provided by consumer identity and access management solutions, which is contributing to the growth of the consumer identity and access management market. The registration process for identity capture can be carried out on several devices, thus establishing log-in credentials and authentication across various channels. Multiple log-ins for different devices and channels is likely to result in friction, which is likely to frustrate consumers, thus resulting in the potential loss of sales. An alternative to this has been to introduce consumer identity and access management login options, such as that of Facebook, which reduces registration fatigue. However, it is seen to raise security concerns, owing to which multifactor authentication is likely to be required. This has led to the usage of consumer identity and access management solutions that offer a simpler process and once registered, a consumer can receive compelling and consistent engagement across different channels with exceptionally low-friction authentication. Identity and access management that is targeted for employees and consumer identity and access management that is targeted for consumers is seen to overlap in terms of solutions, where one solution can perform the functions of both. In the past, overlapping parameters, such as account provisioning, password management, single sign-on capabilities, and directory services, were at a limited scale. However, the gap is being bridged with new features, such as adaptive access, which not only include standard authentication techniques, such as passwords and usernames, but also address additional context-based elements, such as IP address, the device of a user, relocation, and past behavior. Increasing demand for better consumer data unification has also emerged as a significantly growing trend in the global consumer identity and access management market. Some key players profiled in the global consumer identity and access management market report are Acuant, Inc.; Trusona; Globalsign; Iwelcome B.V.; Loginradius, Inc.; Janrain, Inc.; Forgerock Inc.; Okta, Inc.; Ping Identity; SAP SE; Microsoft Corporation; and IBM Corporation.